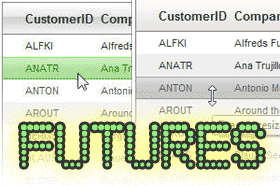 You can see all of the new features running right now in the Futures live demos. The only new control in this release is the re-built RadRotator, and in the Futures build it is still an acknowledged weak control. There is a huge focus on that control in the run-up to the official Q2 release and you can expect it to be much improved by the end of July (and even more so in SP1). There are some breaking changes in RadUpload. The changed features are minor and relate only to localization, but if you use RadUpload localization you'll want to take note. Two embedded skins are being retired in Q2: Default2006 and Mac. The Telerik skin has also be updated, so be prepared to check for design consistency if you use those skins. The old skins will remain available as extra downloads for use as external skins if you need them. Hopefully you enjoy the features in this release. Q2 has been a very short dev cycle for Telerik as we continue to transition to our tri-annual (3 releases per year) release calendar, but I think we've managed to do a lot. Enjoy the "beta" bits and watch for the final release in a couple weeks. Please don't remove the Default2006 theme. It is a nice clean theme! @Matt- I happen to agree with you that it is a nice skin. It's one I've used often. It's being "retired" because it's been identified through research that it is one of the least used skins by Telerik developers. Fortunately, for devs like you and I, we can still use the skin post-Q2. We'll simply have to use it as an external skin. Hopefully this will work okay for your projects.